Last Wednesday in the final Entrepreneurship 101 lecture of the season, Peter Evans, founder and CEO of ExpertFile, took the time to explain how entrepreneurs can successfully communicate their value to potential investors. It’s impossible to do justice to the wealth of information that Peter shared; however, one key point the audience learned was that when you pitch to an investor your objective is not only to get to “Yes,” but also to secure another meeting with the investor. As you can imagine, both of these objectives are easier said than done. Investors consider the search for a solid investment (that is, an investment that will produce a 10-times return on investment) as a “math problem and a throughput problem… a Venus and Mars problem,” explained Peter. Your pitch should connect with an investor on three primary levels: emotional, rational and financial. Your objective should be to get the investor’s attention and keep it. There is no need to over-communicate by cramming your pitch full of irrelevant information about your business. 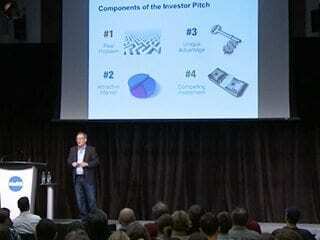 An investor pitch should be about 12 minutes long and in it the entrepreneur should achieve the following goals. Demonstrate the attractiveness of the market in which the venture is operating. Explain how the venture has not only a unique advantage, but also an unfair advantage. Demonstrate what makes the investment compelling, which could involve information about traction, deal structures and exit options, as well as key numbers such as revenue and cost structure. Keep your pitch clear and to the point, because the last thing you want to hear from a potential investor is: “I still don’t know what you do” or “I still don’t understand how you make money.” However, while you want to be concise, you shouldn’t be afraid to make an emotional connection to the problem that you’re trying to solve and to use some visuals to keep the pitch deck engaging. Peter encouraged the entrepreneurs in the audience to use data to support their pitches. The phrase “As evidenced by…” should appear often in a presentation to a prospective investor. If you make assumptions, back them up with reliable information, because they will certainly be challenged by investors who want straight answers. Remember, don’t just throw numbers at your investors—it’s important to provide the context and meaning around them. Investors are most interested in you, your level of perseverance and the complementary fit between the members of your team. Ultimately, it is you who will provide them with the return they are looking for. For more information on how to successfully get to “Yes” when pitching to investors, watch the lecture video below. Entrepreneurship 101 will begin again in September 2014.